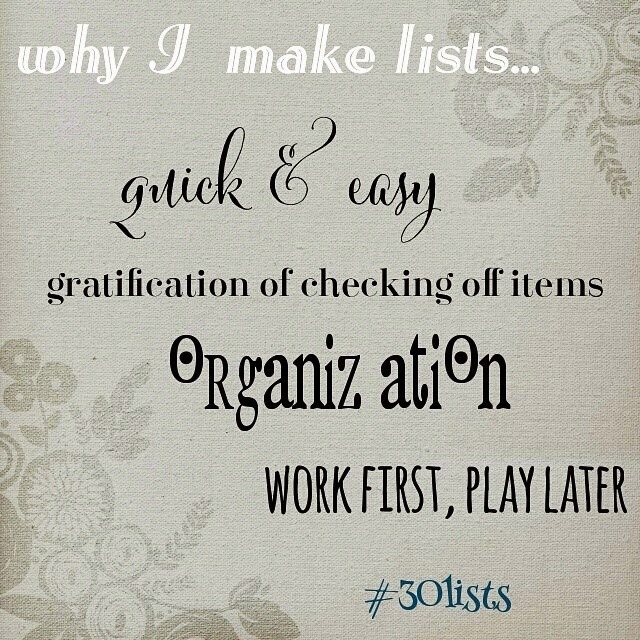 Do you get a sense of satisfaction when you cross off something on your list? Heck, do you start a list just so you can check off what you have already done just to experience it? Are you a type A personality and make lists for everything including but not limited to: to do lists, what to pack, what to see on vacation, what to do while visiting, meal planning, etc? You like to journal but don't have the time and want something short, sweet and to the point? If you said yes to anyone of these, you need to join me for my journey of 30 Days of Lists. It is a challenge by Kam from Campfire Chic and Amy of Lemon and Raspberry. They give you the topics for each day's prompt. You decide what you are wanting to use for a journal. Pen and paper? Digital? Paints, colored pens, stamps or tapes? I ALMOST made a list of supplies, but backed off. I just decided to use what I have on hand which is a multimedia notebook in which I can use pens, pencils, watercolors, tape, or whatever floats my boat. I also used Rhonna Designs on my phone for the 1st prompt so I can post it to my Instagram account. Honestly, I didn't like how my prompt turned out. Guess I am still struggling with that nasty virus called perfectionism. I hope you join me in my journey!